The spot highlights the Audi e-tron GT concept car, and says: "A thrilling future awaits. On Earth. One third of all new Audi models will be electrified by 2025." OK, nut -- a cashew, to be specific. The 60-second spot, appropriately called "Cashew," opens with a man walking in an idyllic scene through a field of tall wheat toward a singular farmhouse on a hilltop, flanked by a single tree, where he is enthusiastically welcomed "home" by his grandfather. The scene is evocative of the afterlife scenes from the movie Gladiator. The grandfather takes the man into a barn and pulls a tarp off an Audi e-tron GT concept car, giving the vehicle to his delighted grandson, and asking him, "What are you waiting for?" Seated inside the electric sports car, the man presses the start button, bringing the car to life, but before he can drive off, his chest begins to convulse. The setting abruptly switches to a cubicle in an office, where the man, unconscious, is being given the Heimlich maneuver by a co-worker, and spits out a single cashew that had choked him. He regains consciousness, clearly disappointed. The spot ends with the message: "A thrilling future awaits. On Earth. One third of all new Audi models will be electrified by 2025." 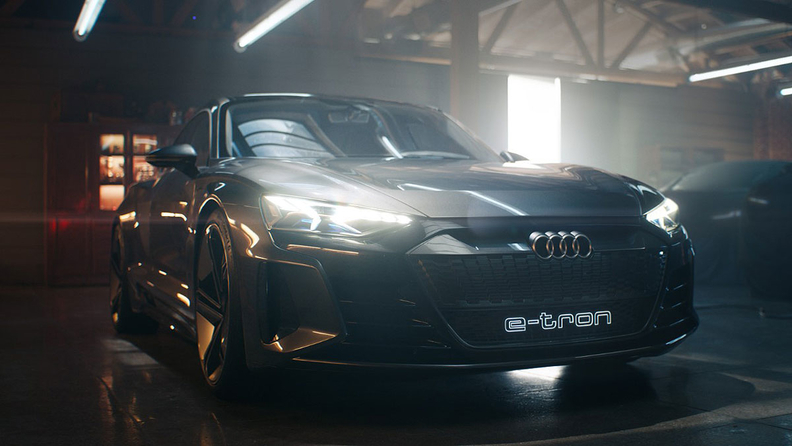 The Audi e-tron GT concept was unveiled by the German premium brand in November at the Los Angeles Auto Show. Though it's not yet scheduled for production, it is expected to be the second battery-electric vehicle in the brand's lineup behind the Audi e-tron crossover, which goes on sale this year. Audi's commercial was created by Venables Bell & Partners and was directed by Ringan Ledwidge. It is expected to air during the second quarter of Sunday's game.